The Northeast Monsoon has ended and inter-monsoon has set in. During the inter-monsoon, a transitional period between the Northeast and Southwest monsoons, there are typically more occurrence of showers over many parts of the ASEAN region. 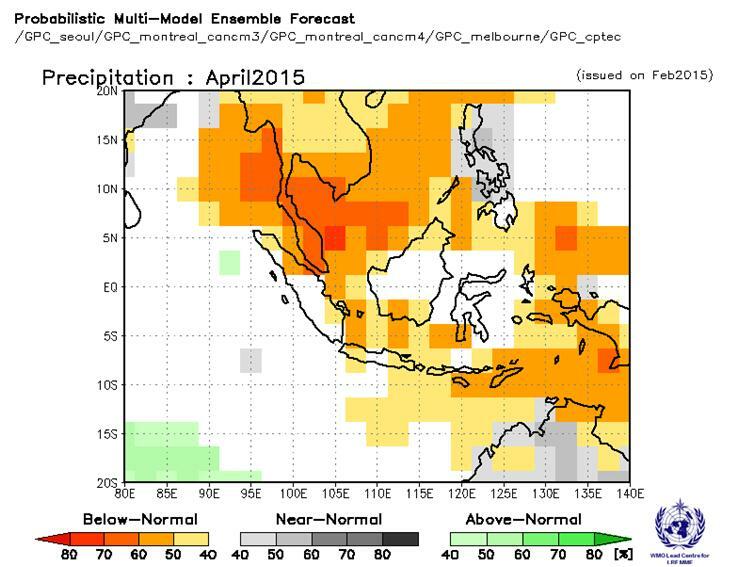 During the season, below-normal rainfall is forecast over the northern ASEAN region and the eastern parts of Indonesia. For the other parts of the region, the predictability is generally low during the April-May-June period or there is no clear signal in rainfall predictions. In terms of the temperature over the ASEAN region, above-normal temperatures are favoured over most parts of the region, except over northern Myanmar and eastern Indonesia where there are no consistent predictions across models. For the land areas across the region, the skill for temperature predictions is very good. More showers are forecast over the region during inter-monsoon period, which are expected to help subdue the hotspot activities in the Mekong sub-region. In the southern ASEAN region, hotspot activities are expected to be generally subdued, but isolated hotspots may emerge during occasional periods of dry weather. The qualitative outlook is assessed for the region in general. For specific updates on the national scale, the relevant ASEAN National Meteorological and Hydrological Services should be consulted. 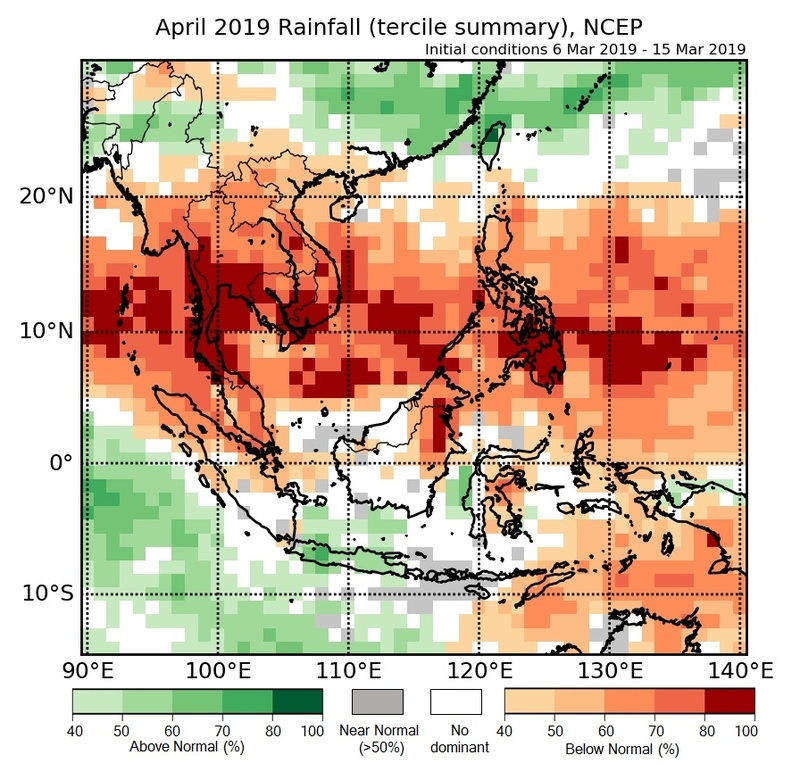 For April 2019, below-normal rainfall is favoured over the northern parts of Southeast Asia. Elsewhere, predictions either have no dominant tercile category, are not consistent across the three models, or have low skill. 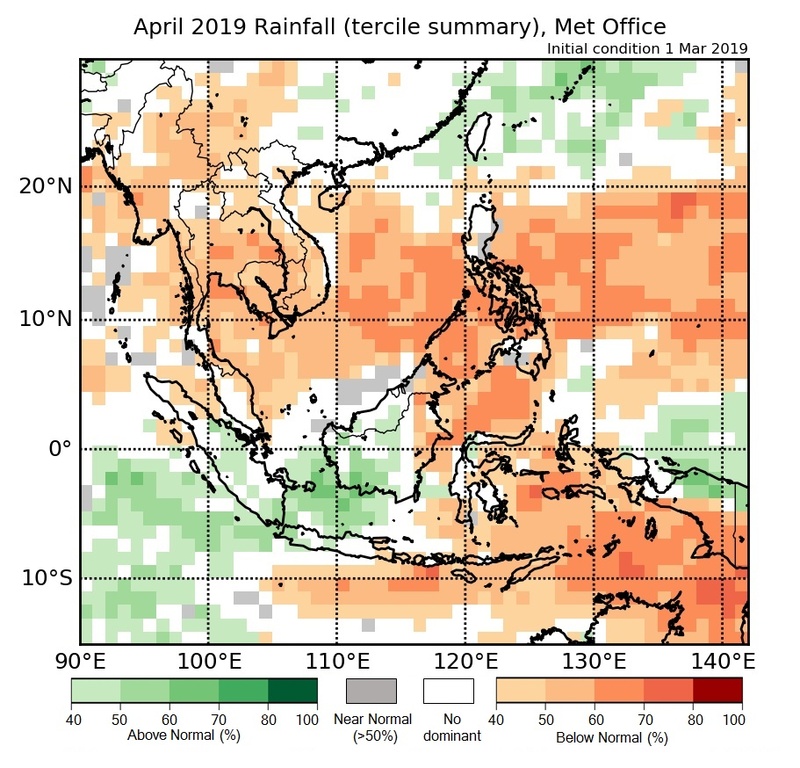 For April’s rainfall, all three models – NCEP CFSv2, ECMWF and the UK Met Office (Figures 1a-c) predict an increased chance of below-normal rainfall for most parts of northern Southeast Asia. The highest probabilities of below-normal rainfall are centred around 10°N. Models’ skill scores for the below-normal category are relatively high over the Philippines at this time of year, with moderate skill for other parts of the region mentioned above. For the rest of Southeast Asia, the model skill is either low, there is no dominant tercile predicted, or no consistent predictions across the three models (see the respective sections of “Model products and verification: NCEP, ECMWF, UK Met Office”). Figure 1a: Rainfall tercile summary predictions of NCEP model for April 2019. 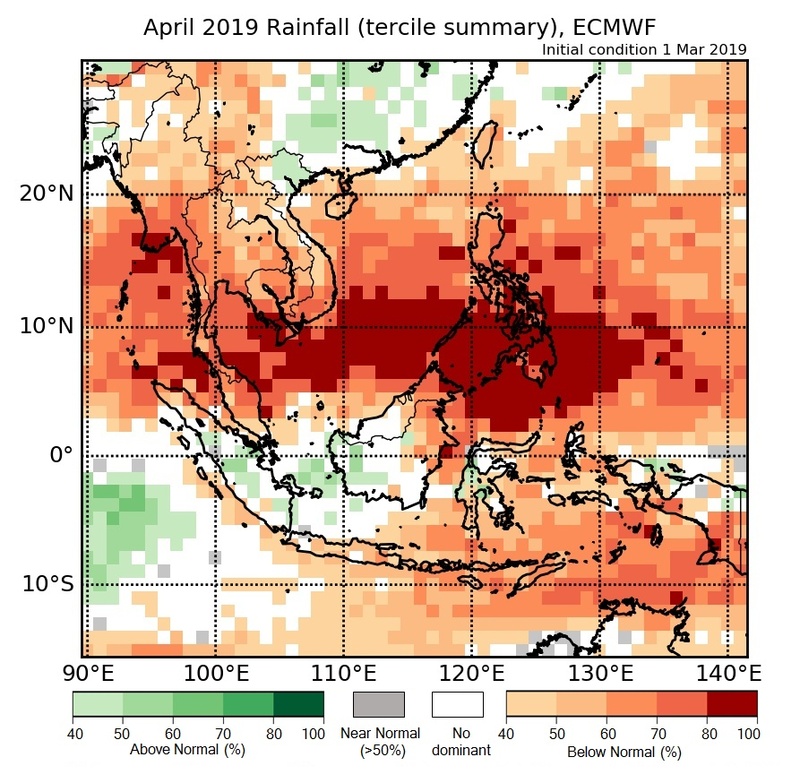 Figure 1b: Rainfall tercile summary predictions of ECMWF model for April 2019 (contains modified Copernicus C3S information). Figure 1c: Rainfall tercile summary predictions of UK Met Office model for April 2019 (contains modified Copernicus C3S information). The qualitative outlook is assessed for the region in general. For specific updates on the national scale, the relevant ASEAN National Meteorological and Hydrological Services should be consulted. More outlook and verification plots, including for tercile and quintile probabilistic forecasts for rainfall, are in the “Model products and verification: NCEP, ECMWF, UK Met Office” on the SEA-RCC Network LRF Node webpages. 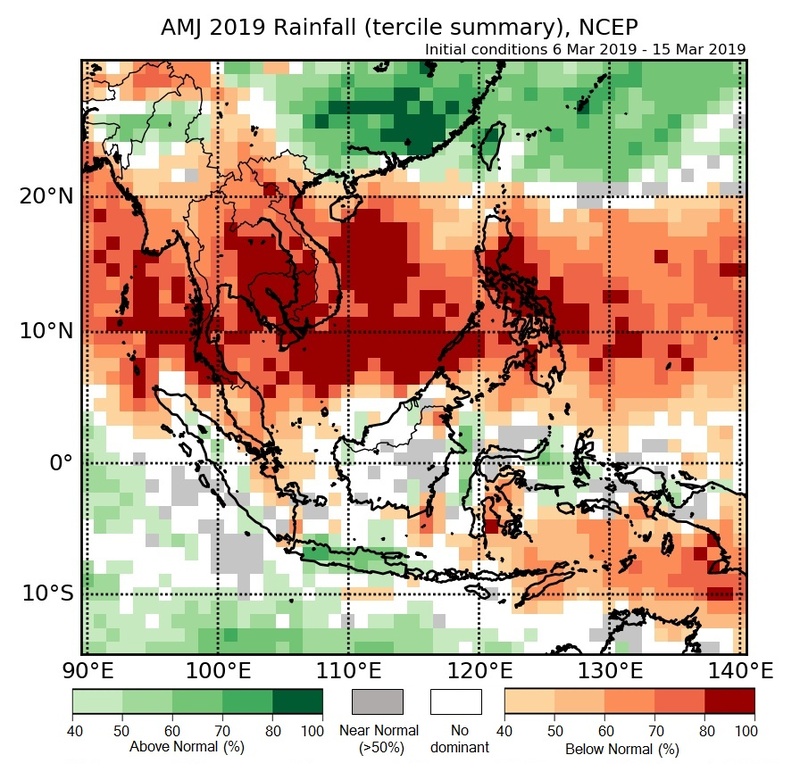 For AMJ 2019, below-normal rainfall is favoured over northern parts of Southeast Asia and the eastern Maritime Continent. 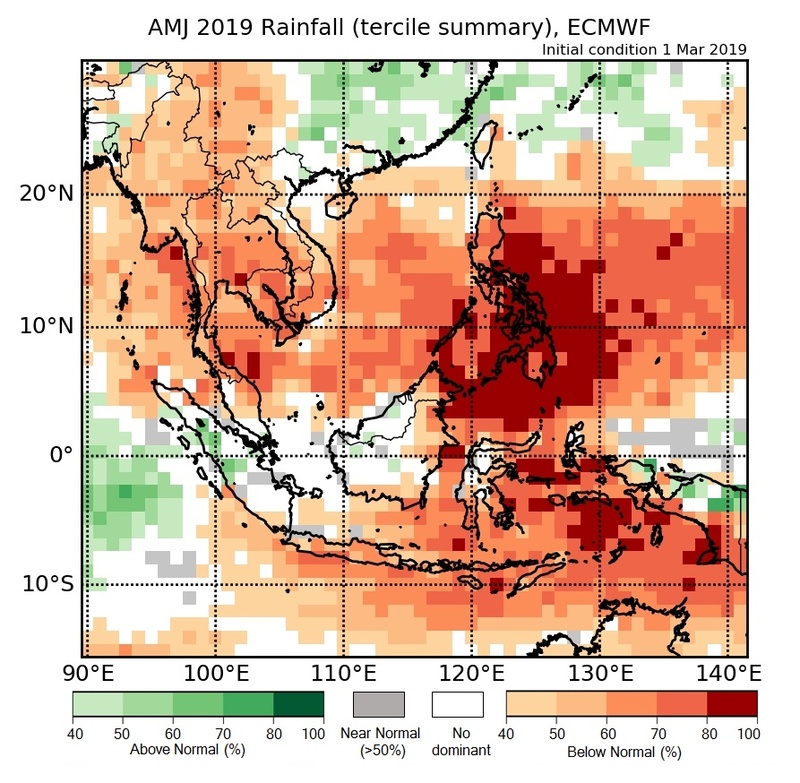 For AMJ 2019, all three models – NCEP CFSv2, ECMWF and the UK Met Office (Figures 2a-c) predict below-normal rainfall over northern parts of Southeast Asia. The spatial extent of the affected areas and the likelihood for below-normal category differs across the different models, with UK Met Office model being the least confident of three models. Overall, the models’ skill scores for rainfall are good over the Philippines, and low to moderate skill for the other parts of the region mentioned above. Over the eastern Maritime Continent (near Sulawesi and Papua), all three models also predict below-normal rainfall, but with varying likelihood. Over this region, there are moderate models’ skill scores for the AMJ season (NCEP, ECMWF, UK Met Office). Elsewhere in the region, there is no consistent tercile category predicted across the three models, or the models’ skill scores are low. 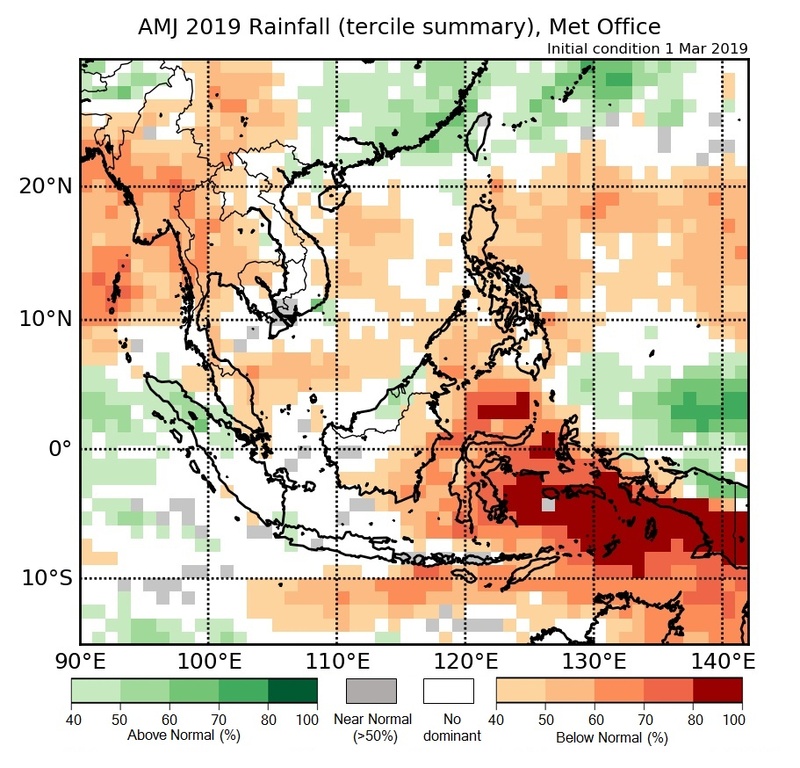 Figure 2a: Rainfall tercile summary predictions of NCEP model for AMJ 2019. Figure 2b: Rainfall tercile summary predictions of ECMWF model for AMJ 2019 (contains modified Copernicus C3S information). Figure 2c: Rainfall tercile summary predictions of UK Met Office model for AMJ 2019 (contains modified Copernicus C3S information). 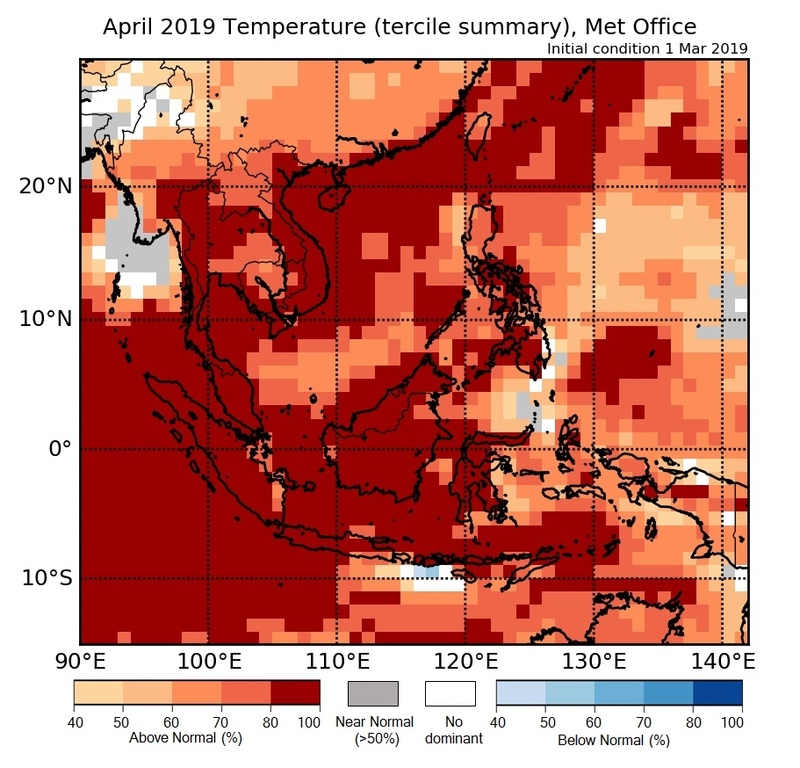 For April 2019, above-normal temperature is favoured over most parts of Southeast Asia. 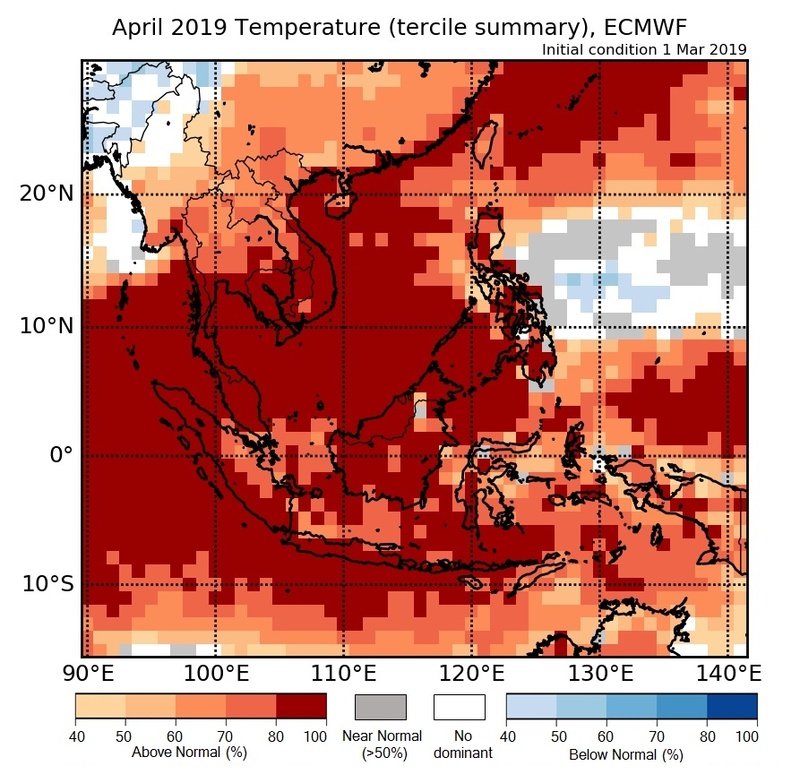 For April 2019, all three models – NCEP CFSv2, ECMWF, and the UK Met Office provide consistent outlook for above-normal temperature over most parts of the Southeast Asia (Figures 1a-c), except over Myanmar and the south-eastern parts of the Philippines where models do not agree on the dominant tercile category. Over most of parts of Southeast Asia, the models’ skill scores for predicting above-normal temperature is generally very good, except for some north-western parts of Myanmar where the skill is only low to moderate (see the respective sections of “Model products and verification: NCEP, ECMWF, UK Met Office”). 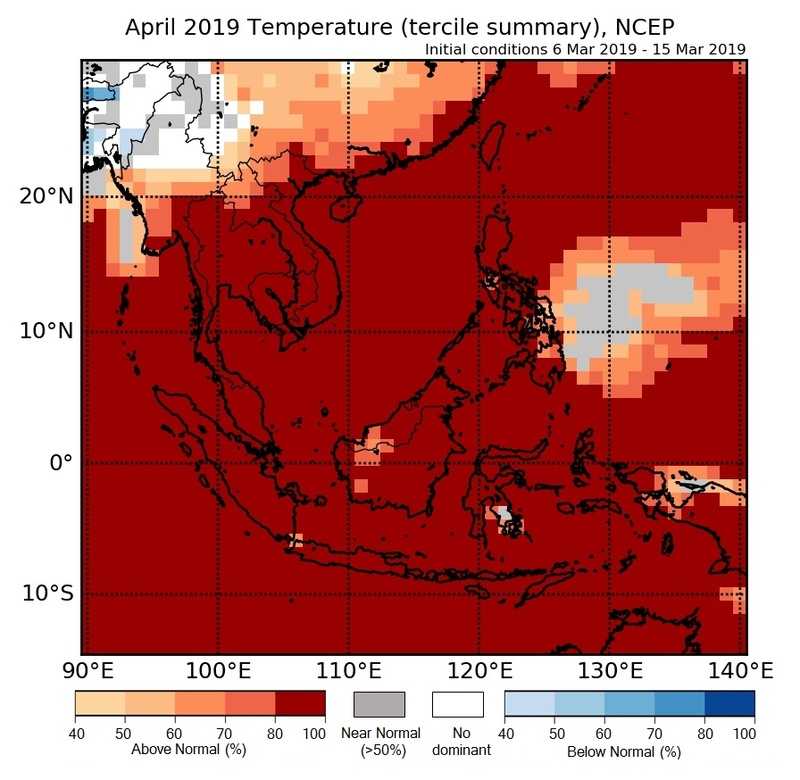 Figure 1a: Temperature tercile summary predictions of NCEP model for April 2019. Figure 1b: Temperature tercile summary predictions of ECMWF model for April 2019 (contains modified Copernicus C3S information). Figure 1c: Temperature tercile summary predictions of UK Met Office model for April 2019 (contains modified Copernicus C3S information). The qualitative outlook is assessed for the region in general. For specific updates on the national scale, the relevant ASEAN National Meteorological and Hydrological Services should be consulted. More outlook and verification plots, including for tercile and quintile probabilistic forecasts for temperature, are in the “Model products and verification: NCEP, ECMWF, UK Met Office” on the SEA-RCC Network LRF Node webpages. 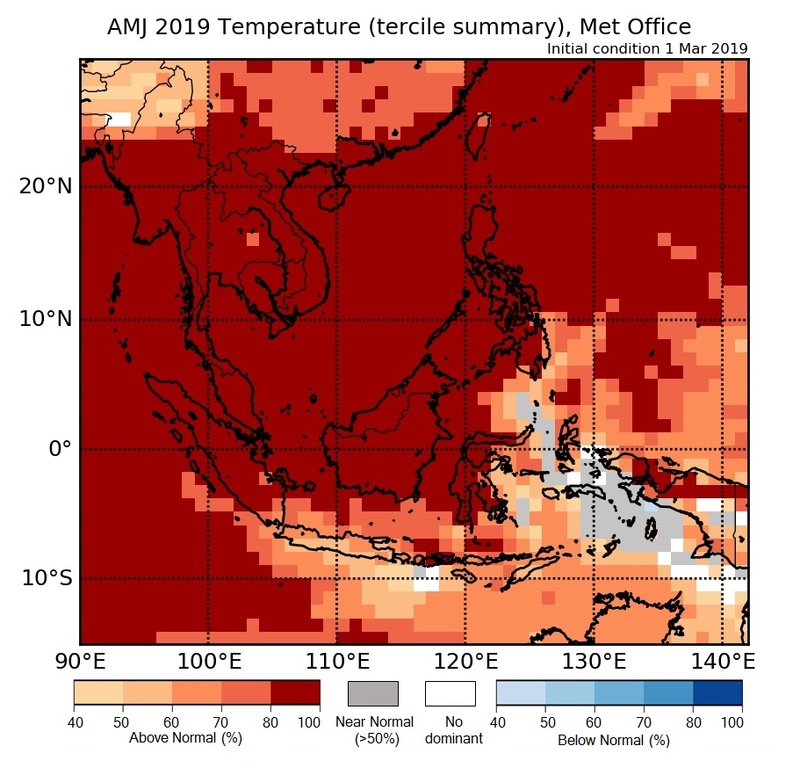 For AMJ 2019, above-normal temperature is favoured over most parts of Southeast Asia. 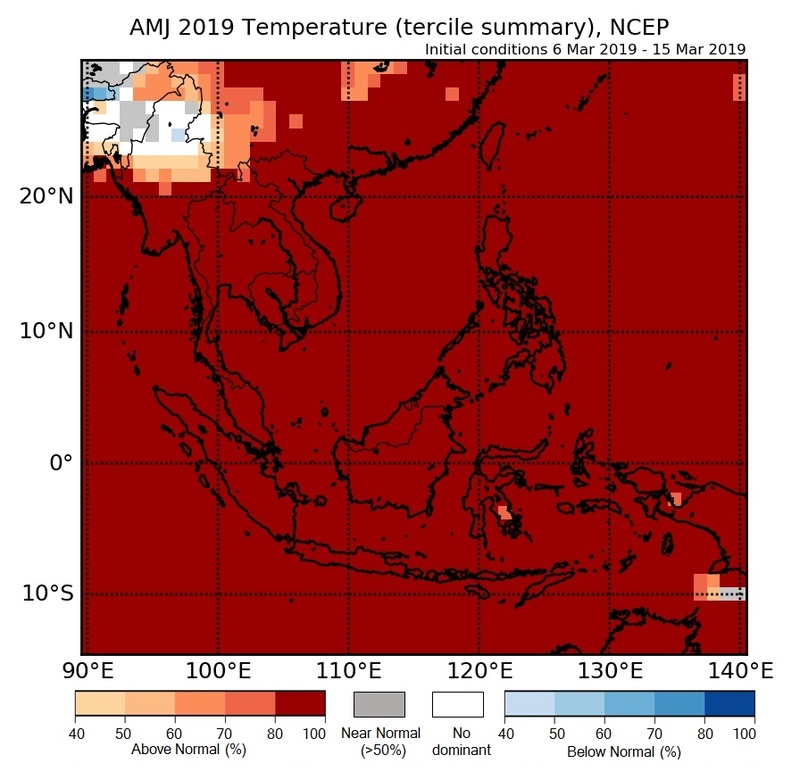 For AMJ 2019, all three models – NCEP CFSv2, ECMWF, and UK Met Office (Figures 2 a-c) favour above-normal temperature conditions over most parts of the region except over northern Myanmar and the eastern Maritime Continent where the three models predict no dominant tercile category. Over land across the region, the models’ skill scores for temperature predictions are generally very good for the AMJ season (see the respective sections of “Model products and verification: NCEP, ECMWF, UK Met Office”). Figure 2a: Temperature tercile summary predictions of NCEP model for AMJ 2019. 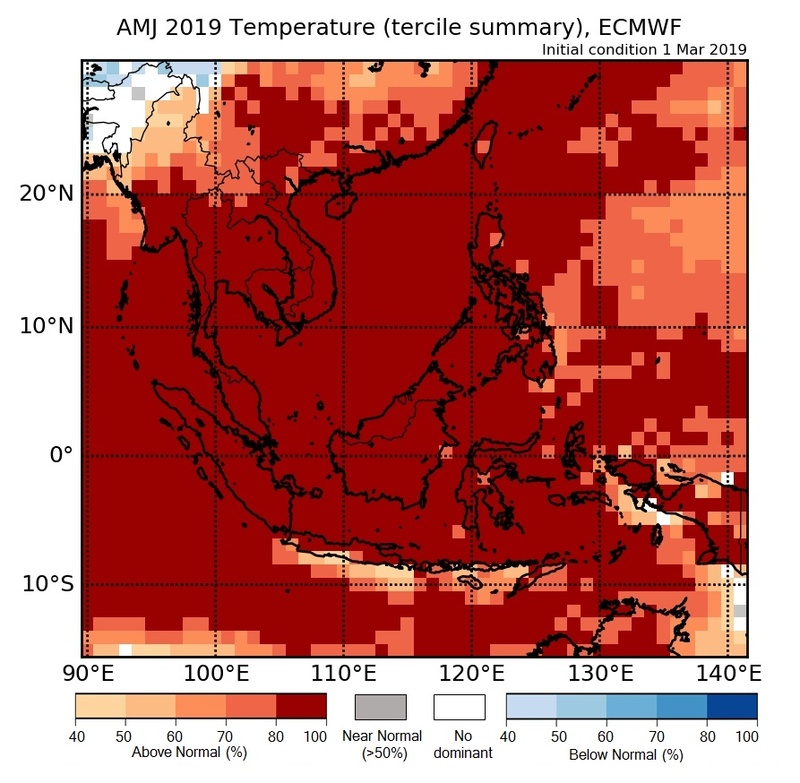 Figure 2b: Temperature tercile summary predictions of ECMWF model for AMJ 2019 (contains modified Copernicus C3S information). Figure 2c: Temperature tercile summary predictions of UK Met Office model for AMJ 2019 (contains modified Copernicus C3S information). The qualitative outlook is assessed for the region in general, and based on the latest run from models provided by the SEA-RCC LRF node. For specific updates on the national scale, the relevant ASEAN National Meteorological and Hydrological Services should be consulted. More outlook and verification plots, including for tercile and quintile probabilistic forecasts for temperature, are in the “Model products and verification: NCEP, ECMWF, UK Met Office” on the SEA-RCC Network LRF Node webpages. What is a seasonal forecast? A seasonal forecast provides forecast information about the general weather conditions at seasonal timescales up to several months ahead. Long range predictions rely on predicting components of the atmosphere and the oceans which show variations at large spatial and temporal scales. Among these key components is the sea-surface temperature – an important indicator in the El Niño Southern Oscillation (ENSO) cycle. To account for the chaotic nature of the atmosphere, seasonal forecast adopts a probabilistic approach and the forecast weather condition is presented as an average over an extended period of time, usually with reference to climatology. ASMC carries out monthly seasonal forecast predictions based on various seasonal model forecasts from the leading meteorological centres, supplemented by individual assessments from respective countries in South East Asia. The skilfulness of seasonal forecast relies greatly on the performance of seasonal models, which differ from one place to another and for different seasons of the year. For example, one way to assess the seasonal model skills is to examine the ROC score. From the figures above, we can see that ROC score map differs greatly from one season to another. During the period from Dec to Feb, a high ROC score region is observed mainly over the Philippines whereas during the period from May to Jul, a high ROC score region is observed over the near equatorial region such as Peninsular Malaysia and Sumatra.